It wasn’t too long ago that Mercedes struggled to get into this guide but with a new range of super hi-tech engines that is all about to change. Mercedes may have been the slowest of the German manufacturers to bring fuel-efficient models to market, but the results are impressive. Gone are the days when you could tell how big a Mercedes engine is just from looking at the badge. As a case in point, both the E200d and E220d share the same 2.0 litre engine. They even have the same compression ratio (an impressively high 15.5:1 since you ask) so the difference in power is more to do with engine management than old school engineering. Either engine is more than up to the job of providing decent pace and given that they achieve the same official fuel consumption the choice is likely to come down to budget. It is worth noting that you need to stick to the standard 17 inch wheels to get the best efficiency with larger rims resulting in a hefty penalty (up to 10 gCO2/km). 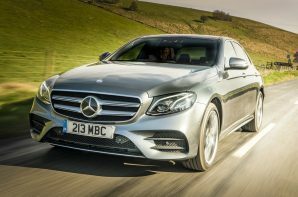 To keep the E-Class ahead of the competition the standard fit automatic gearbox now packs 9 ratios which goes some way to explaining the excellent official fuel consumption figures. Left to its own devices it will shuffle up into the highest gear possible but you can take control of affairs if you want to press on thanks to ‘Dynamic Select’ which provides ECO, Comfort, Sport, Sport+ and a mix and match setting. The latest E-Class takes the best aspects of the previous model but adds state-of-the-art engines and a contemporary interior to keep it feeling fresh. The exec Mercedes has always lagged behind the 5 Series and XF in the driving stakes but it is now closer than ever which means that there is no longer a default option. Which one you pick will come down to personal taste as they all represent executive saloons at the top of their game.